Circa 1900. This stately home features many of its original features, including leaded windows, woodwork, leather wainscoting and parquet floors. 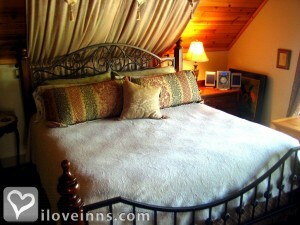 Each of the guest rooms includes beds covered with handmade quilts and clawfoot tubs. The grand, master suite comprises the entire third floor and boasts 14-foot vaulted beam ceilings, Victorian walnut furnishings, a Jacuzzi and six-foot oak buffet now converted into a unique bathroom vanity. Innkeeper Mary Jo Johnson, a pastry chef, creates the wonderful pastries that accompany an expansive breakfast with fresh fruit, granola and delectable entrees. Payment Types Accepted Include Discover, Visa, Travelers Checks, Personal Checks and Master Card. This property has 5 total guest accommodations with private bath, 2 with fireplaces, 2 with hot tubs, 2 with whirlpools, 1 suite. The types of beds available include Queen and King. 14 days notice for full refund. Less than 14 days, deposit will be refunded minus a $20 service charge, only if room is re-rented. The dates this property will honor the certificate are November - April. Gingerbread Pancakes Serve with Wisconsin maple syrup and homemade strawberry jam. Wisconsin is one of the top cranberry producing states. This recipe highlights the wonderful flavors of this tart fruit. Who doesn\'t love chocolate, even for breakfast! Even better when served with the Chocolate Honey Butter included in this recipe. My husband and I decided to celebrate our anniversary at McConnell Inn, and we had a wonderful time. Everything about the Inn is elegant and relaxing, from the welcoming front porch to the dining area to the beautifully detailed rooms. The Innkeeper Mary-Jo was extremely accommodating and helped us make dinner plans as well as plans to explore Green Lake the next day. 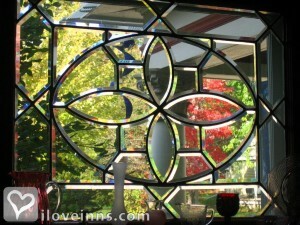 She also prepared a great breakfast of coffee, whole wheat pancakes, and fresh fruit in the morning. 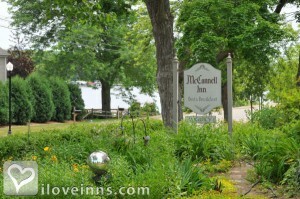 We loved the fact that McConnell Inn is quiet and romantic, but also close enough to Green Lake to allow walking along the lake shore and window-shopping in town. My husband and I spent a week at the McConnell the first week of October. 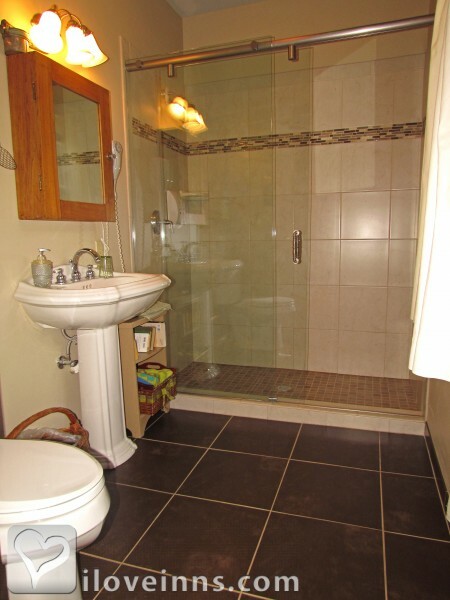 It is a beautiful home and close enough to downtown Green Lake to walk. The hosts, Scott and Mary-Jo, showed outstanding hospitality, and Mary-Jo's breakfasts are wonderful. Already planning a return visit! We have gone back to the McConnell Inn for 3 years now! The Master suite is great for a romantic getaway, the hosts Mary Jo and Scott are very friendly and helpful, and we look forward to the delicious breakfasts and home baked pastries. This is one of our favorite weekend getaways. Romance starts with wonderful beds well apppointed rooms and MaryJo can arrange for chocolates and flowers should it be a special occasion. The location is wonderful - right near downtown and the shops but you are secluded in a shady spot and can relax on the large front porch. A short walk to the beach for a quick swim in the summer or head to the nearby trails for a walk in the winter. Breakfast is a wonderful and always accompanied by a delicious pastry. We have been going for more than 20 years and it feels like a second home. 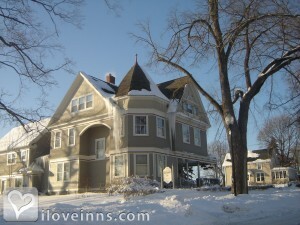 My husband and I have stayed at over thirty-five different bed and breakfasts/inns over the past twenty years. Our choices must be historical, relaxing and romantic. The McConnell Inn is all of the above. Built in 1900, and owned by the same family for the past 28 years, the home has been painstakingly restored to its original grandeur. Renovations, such as fireplaces and Jacuzzi tubs, have been made according to the comfort of the guests, but fittingly enough to seem authentic to the house. There are four guest bedrooms available, each with a private bath, and the entire upper floor of the home has been made into a master suite. (Remember to request a room with a fireplace in the Winter, and a room with a lake view in the Summer.) 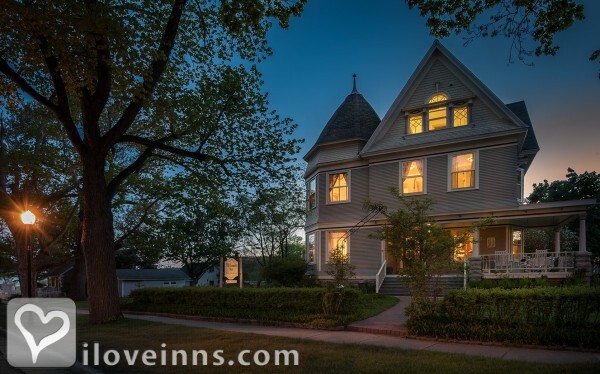 The inn is within walking distance to a few bars and restaurants. Breakfast is served in the dining room between 8:30 and 9:30. Mary Jo served a delicious breakfast, including Gingerbread Pancakes, Homemade Cereal, Sausages, Fresh Fruit, Kolaches (which are a European pastry), Coffee, Tea and Orange Juice. There is a theater up the street that features various artistic entertainment. This would be a very nice place for a group retreat or girlfriends weekend. Every room is as beautiful as the next! There is not very much to do in the town in the Winter, except for ice fishing. If you plan on staying in, this is the place for you! My husband and I recently got married and were unable to take a honeymoon. This was the most relaxing weekend we have had. The hosts are very nice and accommodating and an awesome cook. We will be back as it will be a regular get away. McConnell Inn was a great place to stay. The proprietors were professional and helpful. The room we had (Bayview) was comfortable and well-kept. The breakfasts were great! We even forgot some items and Mary Jo went above and beyond to find them and save them for later pick-up. We were there in March and enjoyed the stay. We stay here each year on a visit to family. We have stayed in a couple of rooms and really enjoy the suite. Its quiet, a good place to relax and read or a place from which to tour the area. The breakfasts are always something really special for us. McConnell Inn provided quietness, comfort, and relaxing environment for our two day stay. 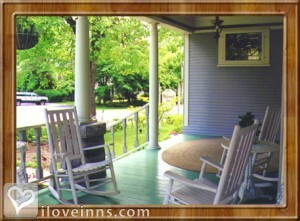 The front porch with comfortable rocking chairs was great for reading and enjoying nature. Green Lake is silent of highway traffic and sirens. Everything is in walking distance. Wonderful nature scenes on the bicycle. 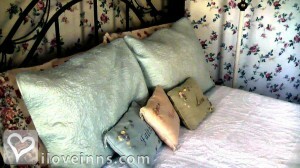 Rooms were filled with comfort - bed, soft towels, radio, wine glasses, rockers, and very quiet. Breakfast was plentiful, delicious, and elegantly served. Thank you Sue & Scott. My husband and I came for our anniversary. This is our second time there. The home is lovely and the breakfasts are wonderful. The room is very well appointed and was comfortably cool even during a major Wisconsin heat wave. 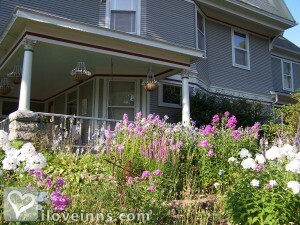 I especially loved relaxing on the front porch , which is shady and surrounded by flowers and trees. We also enjoyed the family style breakfasts and our interesting conversations with other guests. I would definitely come back here. 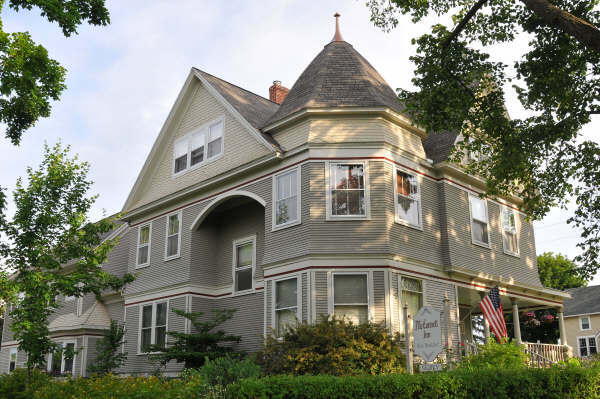 We have been staying at the McConnell Inn for several years, and also several times a year, whenever we come to visit family in the area. Obviously, if we keep coming back, it's because we always have a most enjoyable stay! And we get fed so well ... breakfasts are always delicious and the afternoon cookies a sweet treat! We have stayed in all of the rooms, except for one, and all of them are lovely. Rooms are always clean, well appointed, and very comfortable. We always get a great night's rest - we especially love how quiet the neighborhood is and the peacefulness of the setting by the lake. Mary Jo is always helpful and a delight to work with when making your travel plans. We will be coming back again and again. My husband and I, along with some dear friends of ours, spent the weekend at the McConnell Inn and absolutely loved this place! The attention to detail throughout the home makes every inch of the place a delight. The location is perfect if going to see a concert at the Thrasher House. The warm hospitality and delicious breakfast made this place a "must stay" for our next trip to Green Lake. Pat and Sherry Parrish Sun Prairie, Wi. My wife and I stayed with another couple over New Year's Eve 2013-14. We couldn't have been happier with the McConnell Inn. Owners Mary-Jo and Scott made us feel welcome right away, with a plate of fresh baked cookies awaiting us when we entered the warm, inviting foyer. 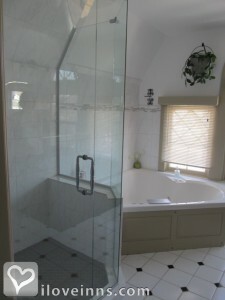 Our room was the Lac Verde, a simple, elegant room with a nice, modern shower enclosure in the bathroom. The entire house felt comfortably warm despite the sub-zero temperatures outside. We asked Mary-Jo where would be a reasonable place for a good dinner and she presented us with menus from several local eateries along with her recommendations. The following morning, the four of us made our way to the dining table to find coffee waiting for us. It wasn't long before the table was covered with homemade pastries, smoothies, pancakes and sausages. We will certainly return at the next opportunity!